Shatottar Rajat Jayanti Sangrahashala is an addition to the list of assets that our Burdwan Municipal High School can be proud of. We deem the students the greatest treasure of our hallowed institution and also the teachers who with their talent and dedication have nurtured the budding talents and led them to come to fruition since the inception of the school back in 1883. It should be deemed as an obligation of all associated this dear institution of ours, to prevent the history from passing into oblivion. 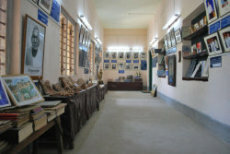 In a bid to preserve the glorious track record of our school with a view to paying a tribute to the founders of the reputation on the institution as well as making the upcoming generations aware of their legacy, the authority decided this museum. We seized upon the gala occasion of the celebration of the 125th year of our existence and the museum was inaugurated on 6th January 2008. 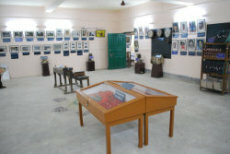 Location:The museum named Shatottar Rajat Jayanti Sangrahashala is housed in a large room in the extended western part of the Centenary Building used by Primary Section of our school. Patronage: The museum mainly the brainchild of Sri Arunabha Chakraborty could not have seen the light of the day but for the assistance of Sri Swapan Biswas, Secretary of the Celebration Committee and the financial support from Sri Promothanath Adhikari and Bijoli Bala Sarkar. Portraits (Both photographs & paintings) of headmasters of both primary & secondary sections, who have retired. Portraits (Both photographs & paintings) of secretaries who had served this institution sometime. 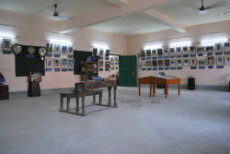 Portraits (Both photographs & paintings) of ex-students who have made their mark in different fields. Photographs of the old buildings of the school located at different spots of the town. Many of them do no longer exist. Old machines like typewriters, cyclostyle printer, spinning machines, antique wall clocks. Old coins collected and donated by students. The donation has been duly acknowledged. A fragmented Avalokitesvara image dating back to the 10th century. Terracotta decorations donated by an ex-student. Samples of art works by students who had participated in an art camp. Old desk. Such desks had been in use before the new type of benches was introduced. Our Plans: We consider that we have just laid the foundation and the mighty edifice that will be a befitting memorial to our school is yet to be erected. We want to extend the museum and enrich the stock with new collections. Assistance in the form of advice, photographs, documents and last but not the least monetary help is highly solicited from all associated with the glorious tradition of the school.